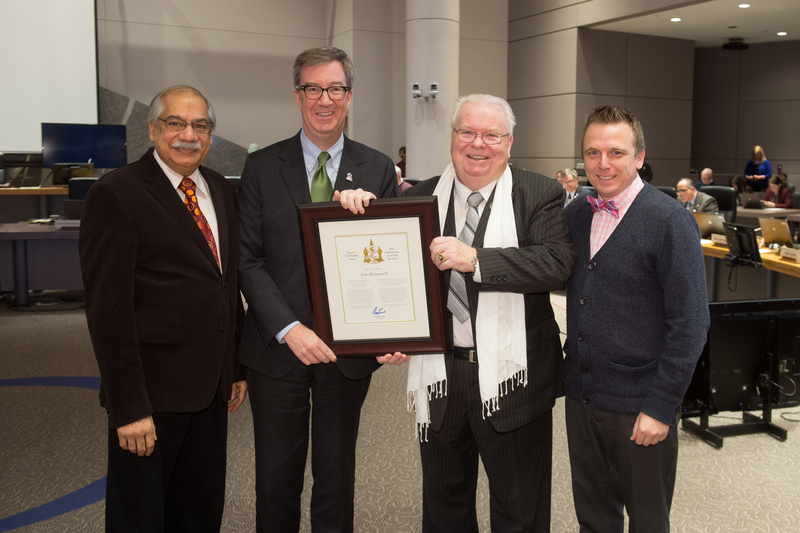 Ottawa – Mayor Jim Watson, Stittsville Ward Councillor Shad Qadri and Rideau-Goulbourn Ward Councillor Scott Moffatt presented the Mayor’s City Builder Award to John Brummell today’s City Council meeting. John Brummell has been an outstanding resident of the Stittsville community for over 30 years. His journalistic integrity, unwavering initiative and joyful spirit as a reporter and photographer with the Stittsville News has heightened interest in local news stories and made them more meaningful to residents. His presence in the community with his trusty camera has become legendary, and his reporting and photographs have played a role in building community spirit and pride. John has helped with many community efforts such as the annual “Stittsville Appreciation Awards”, and the 4H livestock shows at the Carp and Richmond fairs. Recently, he helped with the homecoming ceremony for Stittsville-born Olympic gold medalist, Erica Wiebe, and also helped with plans to rename the gymnasium the “Erica Wiebe Gymnasium”. Many grandparents and parents are proud to have had their young ones featured in a Stittsville newspaper, and when people in the community see their neighbours and fellow residents featured in the paper, it brings the community closer together. John also has a bigger role in the community. He is a great supporter of the Goulbourn Skating Club, and was recognized for his community work when he received the Kanata Chamber of Commerce Citizen of the Year Award for Goulbourn several years ago. In 2013 he received the Senior Citizen of the Year Award recognizing his contributions to the community of Stittsville. John was an active member and president of the Stittsville District Lions Club, and he also played a role in the early days of the Rotary Club of Ottawa-Stittsville, where he remains an honorary member. John was also given the honour of cutting the ribbon to officially open the 2016 Richmond Fair where he received the Ontario Association of Agricultural Societies service diploma. He continues to be an enthusiastic participant and supporter of community life in Stittsville, and always brings a jovial smile and cooperative attitude to all that he does. He is passionate about the retention of the Stittsville village identity and will point out to developers and businesses in the community that their location is Stittsville, as opposed to Kanata. Next: Next post: Get ready Ottawa – company’s coming!